How does the ArsenicMaster system work? Why are people filtering out arsenic from their water? "Hello All, I just wanted to forward you our water test. We started out at 580ppb of arsenic in our water and now it is less than 5 ppb, or undetectable. The ArsenicMaster Whole House Arsenic Water Filtration System has exceeded our expectations and for a fraction of the cost of other companies. Great product and great job! Thank you,"
IMPORTANT NOTE: If your water contains Arsenic-V or a combination of Arsenic-III and Arsenic-V, it will require (a) different or adjunct system(s). If you feel that you don't know or you have questions about your water conditions, we recommend you call us (Toll-Free) 1-877-284-5042 for a FREE Phone Consultation with one of our Water Filtration/Treatment Specialists. We will quickly discuss your water situation and then provide you with straightforward answers and/or high quality affordable options to fully and properly address your specific water conditions. The ArsenicMaster™ Whole House Water Filtration System is an effective chemical-free, oxidation-based technology exclusively available through Vitasalus/Equinox Products. The highly-specialized and simple-to-use Arsenic Master system is designed to completely remove or significantly reduce Arsenic-III (or As III/Arsenite), and lower levels of Lead, Iron, Sulfur/Hydrogen Sulfide (or H2S, rotten-egg odor), Manganese, Copper, Cadmium, Uranium, gross alpha, gross beta, gross gamma, silt, turbidity, and other unhealthy heavy metals. 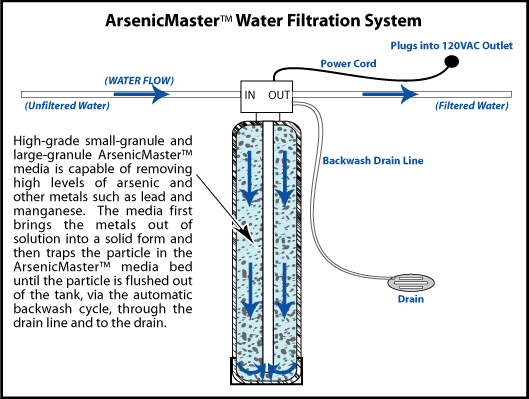 The ArsenicMaster™ system (or arsenic/arsinic water filter system) utilizes a unique and premium-grade ArsenicMaster™ media which is designed to significantly outperform other historically popular oxidation-based media such as Pyrolox®. The Arsenic Master system is designed to be used in place of traditional forms of Arsenic, Iron, and Hydrogen Sulfide treatment and can be installed on either well or municipal water supplies. It can be used as a stand-alone unit or as the perfect companion to softeners, RO systems, carbon-based filters, etc. • ArsenicMaster™ system built using the premium ArsenicMaster™ media which contains more active ingredients and oxidation capability than Pyrolox®, therefore, the ArsenicMaster™ media significantly outperforms Pyrolox® and is designed to completely remove or significantly reduce Arsenic-III (or As III/Arsenite), and lower levels of Lead, Iron, Sulfur/Hydrogen Sulfide (or H2S, rotten-egg odor), Manganese, Copper, Cadmium, Uranium, gross alpha, gross beta, gross gamma, silt, turbidity, and other unhealthy heavy metals. • Shipped Pre-Assembled (tanks come pre-loaded with special media) and Ready-To-Install which greatly simplifies the installation process and significantly reduces installation time and cost. • No chemicals required for media regeneration, just your regular water. • No maintenance required on this system so there are no filters to change, salt or any other regenerate. • Maintenance-Free (self-maintaining via automatic backwash mechanism, requires a drain). • Simple-to-use Control Valve for Automatic-Backwashing. 5 year warranty. • Rust proof wound fiberglass polyethylene tanks feature 150psi operating pressure. 10 year warranty. How does the ArsenicMaster™ system work? The ArsenicMaster™ system is loaded with a unique and premium-grade ArsenicMaster™ media which significantly outperforms other oxidation-based media, such as Pyrolox®, because it is more uniform in shape and possesses more active ingredients and oxidation capability. The ArsenicMaster™ media operates on a principle whereby the Arsenic, Lead, Iron, Sulfur/Hydrogen Sulfide (or H2S, rotten-egg odor), Manganese, Copper, Cadmium, Uranium and other heavy metals are oxidized and trapped on the media bed which is subsequently removed by automatically backwashing the media bed. The ArsenicMaster™ system is maintenance-free (i.e. self-maintaining via automatic backwash mechanism) and NO chemical regeneration is required, just regular water, and nothing is imparted from the media bed into your drinking water. Contaminant Reduction: Designed to completely remove or significantly reduce Arsenic-III (or As III/Arsenite), and lower levels of Lead, Iron, Sulfur/Hydrogen Sulfide (or H2S, rotten-egg odor), Manganese, Copper, Cadmium, Uranium, gross alpha, gross beta, gross gamma, silt, turbidity, and other unhealthy heavy metals. We realize that the best measure of a successful product is when our customers are completely satisfied with the overall quality, performance, reliability and support. We appreciate and respect the needs of every customer and always strive to meet or exceed their expectations with every product we offer. The following customer testimonials are just a small sampling of the many verbal or written testimonials we receive on a daily basis. "Nick / John.......I had my water retested after the installation of these ArsenicMaster and FluorideMaster water filters and everything came back a big fat "0". Your filters did everything you said they would......Thank you - Thank you - Thank you. You will be getting my busness again!! Thanks again,"
"Nick, I just got my result on the Arsenic re-test that I took in last Wednesday--We are so pleased---Arsenic level is now 0.0010 down from 0.0185 mg/L. Thank you ever so much, we definitely believe in your product." "Hi, I would like to say thank you for all the help with the installation of my ArsenicMaster it took the amount of Arsenic in my water which was 298ppb to Zero. I also had a high content of iron and it took it to zero also. My pH is perfect.......I had been hauling my water from 5 miles away. That issue is now closed. What a great product at such a reasonable price I will recommend it to all my neighbors. And the technical support was out standing. Thanks Again,"
I just wanted to forward you our water test. We started out at 580 ppb of arsenic in our water and now it is less than 5 ppb, or undetectable. The ArsenicMaster Whole House Arsenic Water Filtration System has exceeded our expectations and for a fraction of the cost of companies like Culligan, great product and great job! ... Thank you,"
I wanted to take a minute and fill you in on the results we got from installing our ArsenicMaster water treatment system. We live in New Hampshire and we have a lot of granite around us. Consequently we have high metal content in our water. Metals such as manganese, arsenic, and uranium. Here are some of the numbers before the install. We shopped around a lot and we didn't want to lose our water volume. Reverse osmosis wouldn't treat the whole house. Other systems would cut our water flow in half. We took a big risk in trusting this company. Now we are very pleased at our results. It was worth it. I would recommend this product to anyone that has the metal content the we had. The technical support has been fabulous with John. John has been helpful all the way through this process. We are pleased with our ArsenicMaster system. It was definitely worth the money. Regards,"
Pyrolox® is a registered trademark of Prince Minerals, Inc.